The Daily Rant: Giving New Meaning To "Letting The Dishes Soak"
I've been washing dishes in my tub for two-and-a-half weeks. On one hand, it was inconvenient because, well, I had to kneel down in front of the tub, lean over, and contort myself in an uncomfortable position to complete the task. On the other hand, it was super awesome because hello....it's a giant sink. Puts a farm sink to shame. The reason for giving my dishes a bubble bath was because of our pre-renovation renovation. 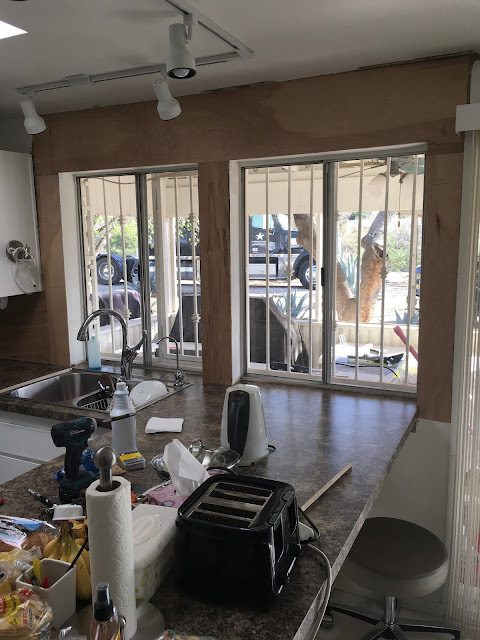 As you might remember, we decided to take the tile off the counters in our kitchen and didn't have a solid plan for what would happen once we did. We eventually decided to do an inexpensive laminate and while waiting for the countertop to be installed I had no sink. Enter the bathtub. This week Ed put the sink back in and hooked up the water, and we started on the backsplash. After much deliberation, also known as my indecisiveness, we decided to use an inexpensive and easy to install vinyl tile in an oxidized metal color. In this photo, you'll see Ed prepping the backsplash for the tiles. 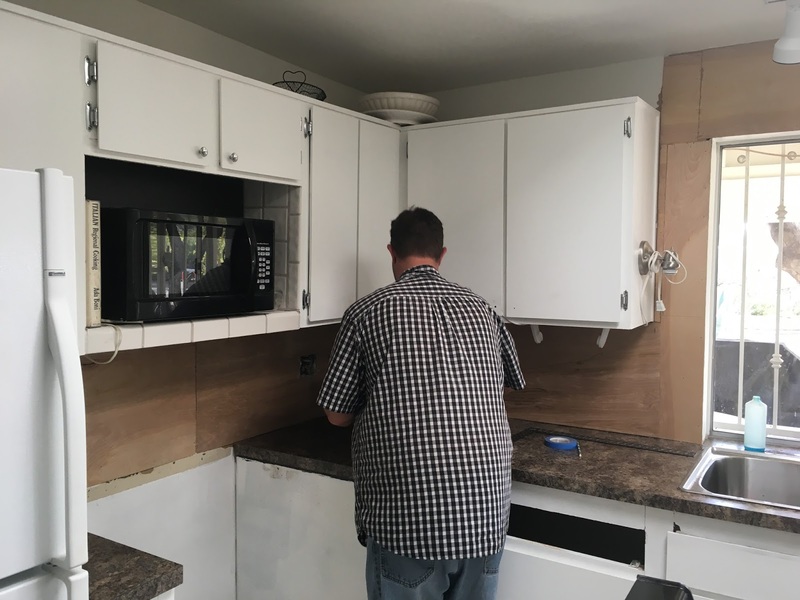 He's installing a 1/8" plywood backing to create a smooth surface for the tiles to adhere to. We chose to make some small changes to the house just to give it a fresh look until the real work starts and didn't want to spend a lot of money on something we're eventually going to tear out. It's coming along quite nicely and I have to say, Ed has quickly mastered all the tasks he's taken on. We'll finish it up come the weekend and I'll post a finished photo of it once it's done.